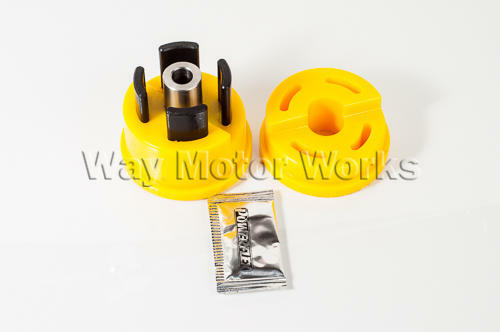 Powerflex Lower Engine Mount Polyurathane Bushing for MINI Cooper and Cooper S R50 R52 R53 02-06. This is complete polyurethane bushing to replace the large end of the stock rubber lower engine mount. These powerflex polyurethane bushings will stiffen up the engine, and help secure it. Helping keep then engine from rocking so much under hard acceleration and braking. Easy install, remove the lower engine mount and press out the large end X shaped rubber mount, reinstall the powerflex polyurethane set and your on your way. This mount is also 2 different stages. The black insert in the middle you see can be removed to make it softer, or leave it in for less flex and better power transfer. If you like this you can also add bushing replacement for the small end of the lower mount also. I added this while doing my LCA bushings, assuming the lower motor mount was worn heavily after 70K miles. Definitely noticed a difference on/off throttle, no yo-yo feeling anymore. The only time I notice an NVH increase is at idle with the A/C on (drive-throughs, stoplights). Other than that it's all gravy.